Gulf Gate including Gulf Gate East, Gulf Gate Gardens, Gulf Gate Manor, Gulf Gate Woods and Gulf Gate Pines. Gulf Gate is one of Sarasota’s most well known, lightly deed-restricted communities, located in south Sarasota within the 34231 zip code. The south of Clark Road location combined with affordable well built concrete block homes cannot be beat. Gulf Gate Drive is the main drive and is a divided palm tree lined street that meanders east and west between Beneva Road and Tamiami Trail. The quiet, well-maintained streets are lined with miles of lighted sidewalks. You will often see folks out in the evening for an after dinner walk or a bike ride. There are 1,562 single-family homes and these owners love the location. It is just a quick 10 minute drive over the south Siesta Key bridge to the #1 ranked Siesta Key Beach and you just can’t get any closer to shopping for every need and service. Gulf Gate also has a semi-private golf course that is located at 2550 Bispham Rd. The course opened in 1965 and has an open guest policy. Players that reviewed the course say that play can be a surprisingly tough par 57 course. There are two courses; an 18-hole 2,311 yard course and a 9 hole executive course. You do not have to join the club to be a resident. 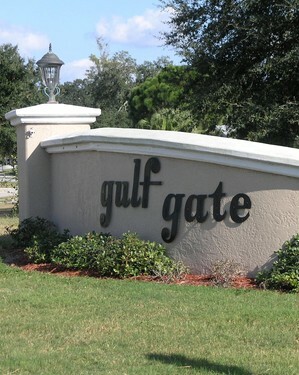 The original Gulf Gate consists of 996 Homes located generally on the north side of the golf course. Construction began in 1960 and the completion was in the late 1970’s. Homes range in size from two-bedroom, two-bath homes of about 1,000 square feet up to four bedroom three bath homes to about 2,700 square feet. You will also find extensive use of terrazzo floors. Lot sizes are from 7,500 sq.ft. up to almost one-half acre. Premium lots are either a fairway or a small lake view. Homes are generally block construction and many have tile roofs and screened pool areas. Most homes have at least a carport but many have two car garages. The Home Owners Association membership is optional. Gulf Gate Manor is 63 homes on the east side of the subdivision. Homes here tend to be more affordable with the grounds keeping and basic cable paid by the very affordable monthly Home Owners Association dues (under $100). Homes here were built between 1966 and 1969. Home sizes are between 1,000 and 2,200 square feet. Most are concrete block construction with tile roofs. Gulf Gate Woods is located on the south side of the golf course made up of 418 single-family residences. The first homes were built in 1970 and construction ended in the early 1980’s. Entry level homes have two bedrooms and two baths with about 1,100 square feet.. The upper end homes will be four bedrooms and three full baths with square footages up to 2,900, Homes are mainly concrete block and stucco with many homes having tile roofs and/or caged pools. Lot sizes are from 8,500 square feet up to nearly three-quarters of an acre. Most homes will also have at least a two-car garage. Gulf Gate Pines is the final major installment of homes on the south west side of the subdivision. Homes are located on the non-through Pineview Circle. This is a heavily treed area with lot sizes from 8,500 to 11,500 square feet. Homes were built between 1978 and 1988 and range in size from 1,700 to 3,000 sq.ft. Many homes have pools and two or three car garages. Gulf Gate Gardens and Gulf Gate Manor are condos and villas. Sarasota County maintains the Gulf Gate Public Library. This is a convenient benefit for local residents. The library is located at 7112 Curtis Ave.
Gulf Gate Village hosts many local merchants including local restaurants, breweries, jewelry stores and many other specialty community needs. These establishments are owned and operated by locals residents. The Village is a unique feature of the area. St. Thomas More Catholic Church is also located within the heart of the subdivision. Gulf Gate schools are Gulf Gate Elementary, Brookside Middle, and Riverview High School. We are the local experts in Gulf Gate and the Sarasota Real Estate Market. We welcome the opportunity to work for you and find that special place you can call home.